We feature a wide array of box sizes and styles to suit your packaging requirements... We literally have millions in stock! Our huge selection includes application-specific boxes for moving, hazardous materials, insulation, printing, master packing, retention/suspension and file storage. 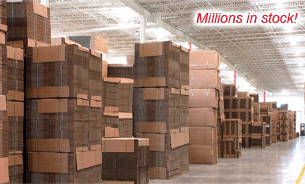 With over 1,000 box sizes and 10,000 packaging and industrial products, we have it all! Find what you’re looking for with these easy-to-use search features!